Haim Steinbach’s earliest works came out of minimalist painting and subsequently conceptual art but an early fascination with surrealism remains obvious in his work.1 He came to international prominence in the 1980s, when his use of found objects often caused him to be associated with the neo geo and commodity art movements that dominated New York at that time. In reality it makes more sense to think of his work in relation to European art and in particular to arte povera. This is because his works far exceed the literal presentation of readymades by engaging poetic associations and temporal structures that would be quite foreign to the materialist concerns of younger artists working in America. 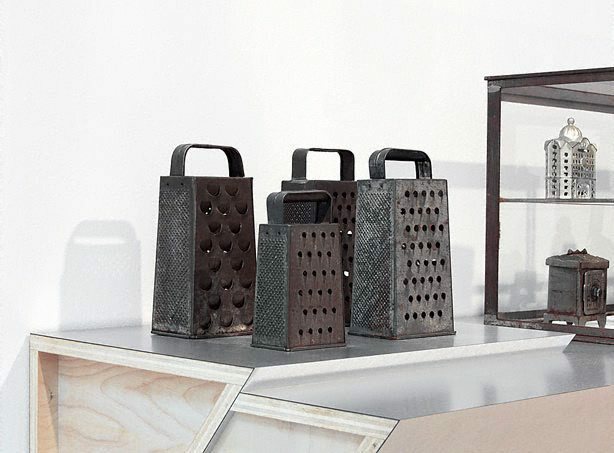 ‘Untitled (graters, Victorian iron banks)’ presents and frames these found objects on a shelf designed for the purpose. 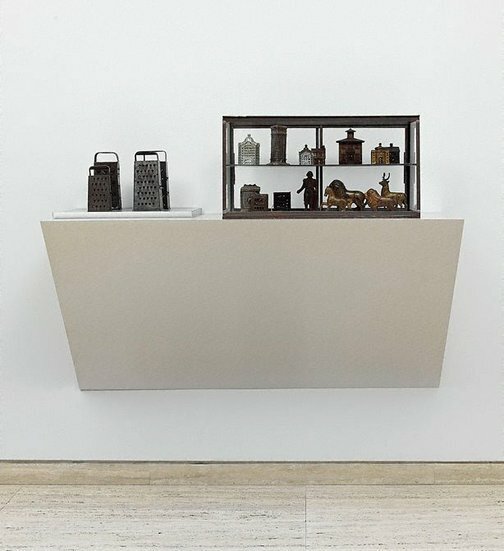 The carefully crafted shelf contradicts the appropriative aspect of using found objects and suggests a highly specific sculptural format, implying two domains or contested hierarchies in representation. Steinbach retains enough of his training as a painter to view the surfaces of the laminates he applies to the shelf as important as the particular qualities of the objects. 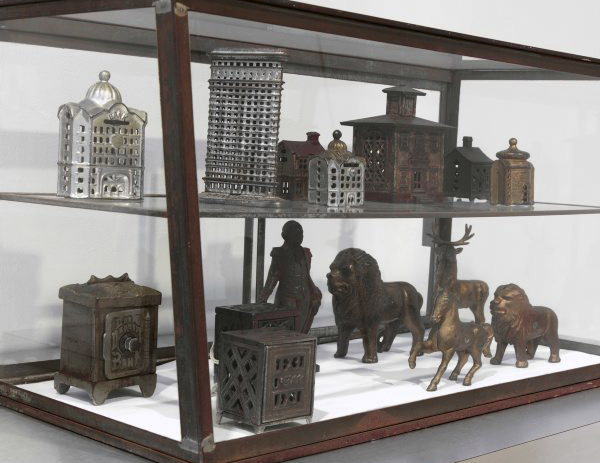 For example, the highly specific nature of each shelf makes it harder to ignore the shelf as a frame because it is chosen for its appropriateness to a dialogue with the found things upon it. Steinbach is first and foremost a collector; his studio is full of found objects awaiting a chance encounter. He is very interested in the Duchampian or surrealist use of chance. For example, he regularly visits an antique shop in the small country town where he likes to spend his summer holidays. One day the woman who runs the shop took him out the back and showed him how she had anticipated his desires and accumulated a group of objects to make a work. Steinbach was delighted and accepted her choice as his own. Anthony Bond and Victoria Lynn, AGNSW Collections , 'Contemporary Practice - Here, There, Everywhere ...', pg. 229-285, Sydney, 1994, 233 (colour illus.). Charlotte Day, Reinventing the wheel: the readymade century , 'Introduction', pg.85-88, Melbourne, 2013, 48 (colour illus. ), 86. Trevor Smith (German and English versions) English version, Haim Steinbach , 'Time signatures or Haim Steinbach's still-life', pg. 20-27, Germany, 1994, 115 (illus.). This work is not in this exhibition but is illustrated in the catalogue. Paula Latos-Valier, Biennale of Sydney 2000 , 'Looking back: the biennale of Sydney 1973-1998', pg.160-190, Sydney, 2000, 184 (colour illus.). This work is not in this exhibition but is illustrated in the catalogue.